To ensure high quality business phone conversations it is vital that you are setting up VoIP correctly for your business. Without proper planning, the financial savings from your new phone service may pale into insignificance due to lost business deals from dropped calls! In this guide you will learn five of the recommended steps to setting up your business network ahead of time for smooth VoIP sailing. By following this guide even before your phones have arrived, you will be maximizing your chance of success. Before even signing up with a VoIP provider you should verify that your business Internet has the speed and quality needed for VoIP. We have made this easy for you with this comprehensive VoIP test. After running this test, make sure the summary indicates that your Internet is good enough for VoIP. Definitions of each parameter can be found on the test page. The speed part of the test may also be important, depending on the number of concurrent phone calls you need to make. A good rule of thumb is 100Kb/s per phone call, so if you could have up to 10 concurrent calls that equates to 1Mb/s of required Internet speed and that is just for voice. Also, this would be needed for uplink and downlink. This should not be an issue for most businesses these days but it is worth considering. 2 - Network - Hard Wired or Wireless? Is your business local network hard wired using CAT5/6 Ethernet cable or is it all wireless (WiFi)? It may even be a hybrid model, which is common these days. You will need to determine the location for each phone in your business as this will ultimately determine your connection options. You may find you have some hard wired connections and other areas that rely on WiFi. Also make a note of locations such as break rooms and lobbies, where it may be useful to have a phone installed but may come at a price in terms of monthly cost and potential installation difficulties. Nearly all IP phones default to hard wired connections and include CAT5/6 cable in the kit. If you have hard wired RJ-45 Ethernet in your office then you are good to go from a connectivity standpoint. This is always the preferred connection as it keeps the latency and jitter low and there is less interference compared to a wireless connection. It is also worth noting that since this is the recommended way to setup phones in your office, if it is possible to add wiring to your office to facilitate this, we would advise you to do so. If your phones are hard wired and thus have low latency across your network and assuming you have a good Internet connection, your phone system should never let you down. WiFi on the other hand, is not standard on most IP phones. Higher-end IP phones tend to have it built-in or may support a USB WiFi adapter that can be used to connect the phone to your local WiFi network. Your other option here is to purchase a WiFi bridge. These devices come in many forms, from a small form-factor device that has wireless and one RJ-45 Ethernet port to a larger Access Point (AP) that can be used in bridge mode. Either way, this will connect to your primary WiFi router over wireless and then you can hard wire the phone to the LAN side of the AP. The only slight downside here is the additional latency, since all audio calls have to go across the wireless interface to get to the primary router and then out to the Internet. It is unlikely to cause issues though. A final option is to use cordless phones. This is not ideal, in that the quality of the audio tends to be poorer than using an IP phone but it may work for your small business, especially if you require some form of mobility. To connect the standard DECT cordless phones you will need an Analog Telephone Adapter (ATA). This will connect to your router/modem using CAT5/6 cable and will connect to the cordless base. The handsets can then be placed at convenient locations. There are also options for IP based DECT cordless phone systems these days, which removes the need for the ATA, simply connect the base directly to your modem/router. A final note for this section is powering the phones since it very much relates to the location you are choosing for each phone in your office. Most IP phones will require access to a power outlet so ensure you have one close to each phone location. Many of the IP phones in the market also support Power over Ethernet (PoE) so if you have a PoE network switch in your office and are hard wiring the phones, this would be one less item to be concerned about. Your router is a vital part of your business as it acts as your gatekeeper and protects and secures your internal network and routes traffic to and from the Internet. Most likely you already have a router in your office, at least I hope you do! It may even be a router/modem combo device. Either way, you must ensure it is compatible with VoIP. We have made this easy for you, check our VoIP modem and router compatibility guide and ensure your device is suitable for VoIP. If you take the time to read the modem/router compatibility guide, and I hope you do, you will see that one of the most common issues with routers and VoIP is a feature known as SIP ALG (Application Layer Gateway). This tends to cause many issues for VoIP, such as dropped calls and one-way audio. For this reason we wrote another guide that may be useful, on how to disable SIP ALG for some of the more popular routers. It is important to make a note of any additional routers you have in your office and how they are being used, for example, are they acting as routers or just switches or APs. A true router has Network Address Translation (NAT) and firewall functionality to block unwelcome guests and to map a public facing IP address to many private IP addresses in your network, such as your phones. It will usually have a DHCP (Dynamic Host Configuration Protocol) server which serves the private IP addresses to all devices on the private side of your network. Typically you will want only 1 primary router doing all of the functionality mentioned above and then any additional routers downline will act as simple switches and APs or wireless bridges. This ensures that your network has only 1 level of NAT, which is important for VoIP. If you have additional routers and NAT functionality and have phones downline from these routers, the additional NAT levels can cause routing issues for phone conversations. The problem here is that the VoIP calls will typically embed the public facing IP address and the private IP address into the control packets. If you add additional levels of NAT it becomes difficult for the audio packets to route to their intended destination on your network. This can be tough to facilitate but if you can purchase an Uninterruptible Power Supply (UPS) that can support your phones and Internet modem/routers during power outages then this could save you some headaches. Make sure the provider has apps for its phone service, as you will then be able to make and receive calls using the smartphone app. The WiFi mode will not work if your Internet or power is out but the cellular mode will, providing you have good cellular signal strength, so business calls can still be made and received using the app. 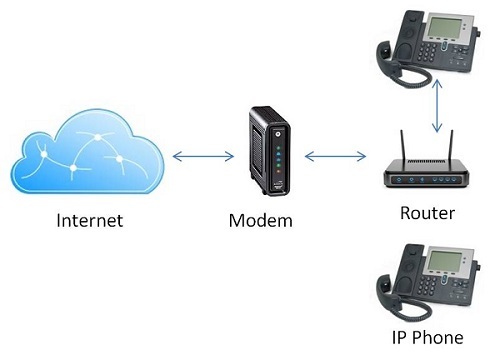 Most VoIP services have an option for call forwarding and follow me type functionality. For VoIP services, make sure these features are available as during a power or Internet outage you can forward all calls to a number of your choosing, for example a cell phone. Hosted VoIP services usually have a web portal you can log into to control these features so using your cell phone you could log in and control this yourself without needing any support from the VoIP company. VoIP phone companies offer rich feature sets and at highly competitive pricing. This is fueling great demand among businesses, especially small and medium sized businesses. However, if you have jumped in and signed up for service without preparing your office for the arrival of your VoIP phones, you may be in for some nasty surprises. This guide has been written to prepare businesses for VoIP and by following each step you have greatly maximized your chances of success and high quality phone service.